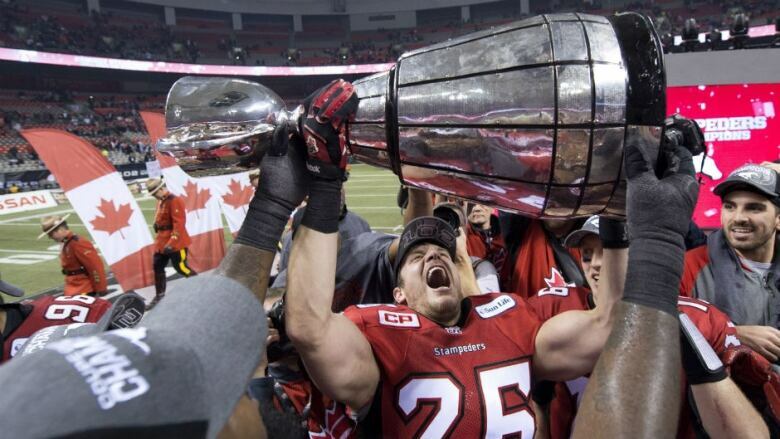 The Calgary Stampeders were so excited after winning the Grey Cup, they broke the trophy. Calgary linebacker Juwan Simpson hoisted the Grey Cup above his head to celebrate Calgary's 20-16 victory over Hamilton on Sunday when the cup section of the trophy started to split from its base. "I think I'm the one that did it," said Simpson. "I don't know. I grabbed it and was excited, and all of a sudden, it got a little (loose.) Some glue and some duct tape and it'll be good. "I don't know if I was holding it (when it broke) or I was holding it before it went off, but I felt it weaken in my hands — and I politely gave it to somebody else." Simpson said he hopes the CFL does not send him a bill for the mishap. "But I got me a Grey Cup cheque," he said. "In a worst-case scenario, I can pay for it." The Stamps get a $16,000 bonus for winning the Grey Cup. It's the sixth time the CFL championship trophy has been broken during Grey Cup celebrations. Three times the Edmonton Eskimos have damaged the statue. An Edmonton player accidentally dropped it in 1978, then an Eskimos player sat on it in 1987. In 1993, Edmonton offensive lineman Blake Dermott headbutted it. The B.C. Lions damaged the Grey Cup in 1996 when the trophy broke away from its base. Most recently, one of the handles of the Cup broke off as the Toronto Argonauts were celebrating their 2012 championship — the trophy's 100th anniversary. It also survived a fire in 1947 when the Toronto Argonauts rowing club — the reigning champions — saw their clubhouse destroyed. Stampeders quarterback Bo Levi Mitchell said he saw the top of the trophy break off, but he wasn't too concerned about it. "We won a Grey Cup, man — that's all that matters," said Mitchell. The mishap with the trophy was news to Stamps general manager and coach John Hufnagel. "How would I know that?" asked Hufnagel. "Next question."